Sure, we all know the importance of working out. However, we often make excuses for not doing so. The most common excuse is a lack of time. Because we have other responsibilities and obligations, exercising gets put on the back burner and we miss out on the benefits. Wouldn’t it be nice if there was a simple, highly beneficial exercise routine that everyone had time to do? There might be. The CDC’s recommendation is to work out 30 minutes per day at least five times per week, or engage in 150 minutes of high intensity exercise per week. However, people often have a hard time fitting this into their schedule. It’s not exactly a huge time commitment, but 30 minutes is easy to procrastinate…and procrastinate…and procrastinate. Since this seems to be such a challenge for people, trainers and therapists have sought an effective way to fit the benefits of exercising for 30 minutes into a shorter period of time. Therefore, we have the 7-minute workout. 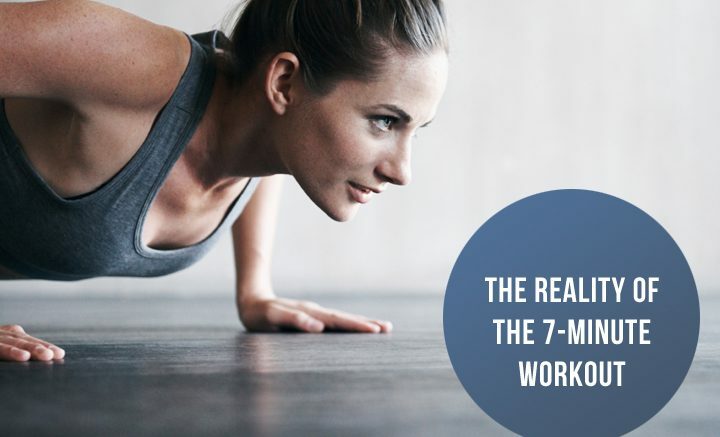 The 7-minute workout is a new workout method that claims to be the newest and most effective way for busy people to work out. However, it’s important to know that working out for seven minutes five times per week won’t have nearly the same weight loss and healthy properties as working out for 30 minutes per day. Your body simply can’t burn the same amount of calories and stretch the muscles enough in that time frame. The media tries to tell you that the 7-minute workout is all you’ll need to stay fit and thin, which isn’t entirely true. Working out for 7-minutes with high-intensity can do your body some good, but it’s important not to set your expectations too high. When analyzing the 7-minute workout and its effectiveness, Adam Bornstein, the creator of the popular fitness blog Born Fitness, says that he sees far too many people disappointed by myths surrounding the 7-minute workout routine. He goes on to discuss how frustration can lead to giving up on exercise altogether, and that it’s very unlikely for the body to get fit in just 7-minutes per day. He also says that multiple sessions of 7-minute workouts per day can be beneficial for the body, and it’s often easier to work those training sessions in rather than going to the gym for an hour at a time. Bornstein notes that not all exercise is created equal, and that certain workouts will be far more effective in a seven minute period than others. All in all, the 7-minute workout can be more effective than no workout at all, but you can’t expect it to get you beach-ready. You can maximize the effect, however, by participating in exercises that are better for your body than others. Here are some of the most effective 7-minute workouts available. When the 7-minute workout emerged, it began with an original workout routine. Others were developed later on, but this one started it all. In this routine, you do each exercise for 40 seconds without breaks in between. To maximize the effectiveness of this workout, it’s very important to work straight through the seven minutes so that your heart rate stays up and you remain completely active for the full seven minutes. If you must take a break, pause for no more than five seconds, and remind yourself that there’s only seven minutes – your body can handle this short amount of time. Do the following exercises in order for 40 seconds each. Repeat if you have time. Count your repetitions within each set of 40 seconds and try to challenge yourself to more reps each day. For those who have mastered the original 7-minute workout, another was created as more of a challenge. Again, this series is made up of 10 workouts, lasting for 40 seconds each. Though many of the exercises are the same as the original, some of the movements are more advanced, so it’s important to first master the original 7 minute workout before moving on. This workout system was designed specifically for people who don’t have a lot of equipment on hand. You won’t need a wall, a chair, or weights like you do with the other workouts. You can do it anywhere at any time, making it the perfect lunch break workout or something to do during TV commercials. Remember to take special care when doing these exercises to avoid injuries. Pay attention to your body, and if you notice pain or discomfort, slow down or stop to avoid injury. You might also look up videos and tutorials on how to do each exercise correctly to avoid unnecessary injury. The 7-minute workout alone may not be enough to get you bikini-ready, but it can help you increase your activity level. Use this as a starting point to launch a healthier lifestyle. Want more information about staying fit and healthy? Top Workout Reviews is a hub of information on all things health and fitness related. We offer reviews, tips, tricks, and workout ideas to help you change your lifestyle for the better. We’ll also give you coupons for nutrition shakes, meal delivery plans, and other weight loss services. For more information about what we offer or to request content, contact us today! Be the first to comment on "3 Effective Workouts You Can Do in 7 Minutes"